The following tutorial show how to send an existing e-mail at a given time. 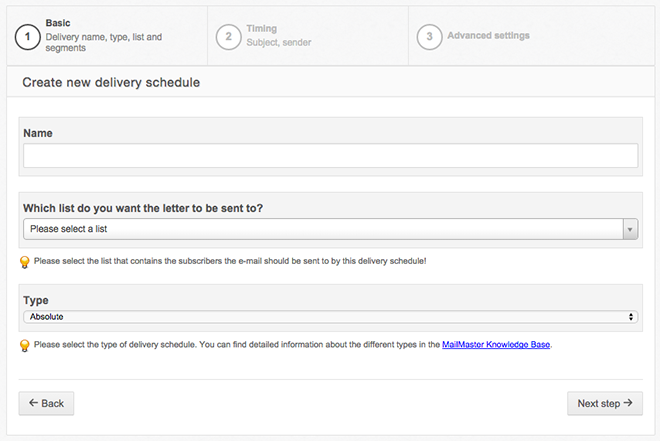 In Delivery schedule you can set that when and to whom you want to send your e-mail. Click on the e-mail in the left menu then click the "Schedule new delivery" button. 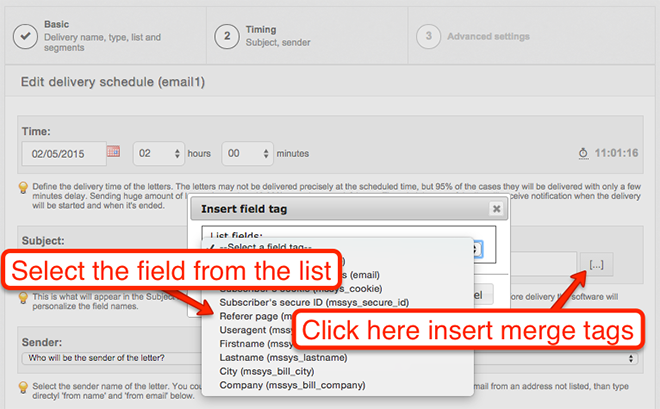 Important: you can create more than one delivery schedule for your e-mail. First, type the name of the delivery schedule. Think through to which list or segment you want to send your e-mail and when, and give a name accordingly, for example: Spring newsletter for women. Select which list you want the letter to be sent to. If the list has segments these will appear. 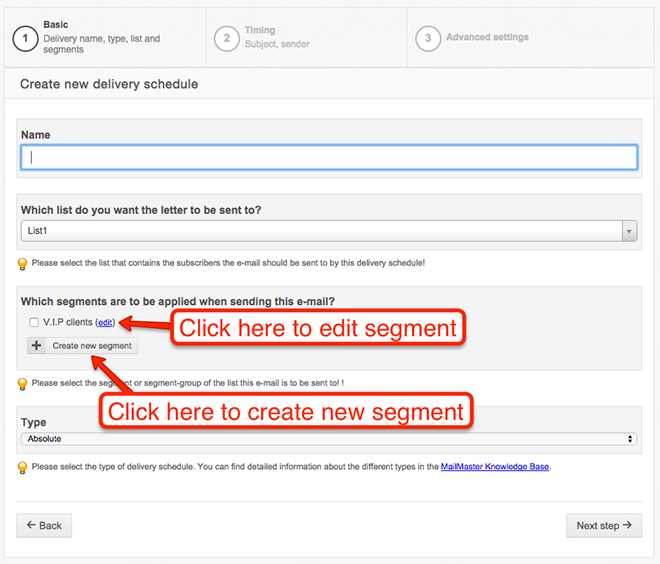 If you want to send the e-mail to a given segment check it, otherwise, leave the segments' checkboxes unchecked. If you check more than one segment the e-mail will be sent to all segments i.e. every subscriber will receive it who is in at least one of the segments. You can edit a segment or create a new one from here. Select the type of the delivery schedule. Now select "Absolute", that means the e-mail will be sent at a given time. There are several other types; there is a detailed explanation of them here. Click the "Next" button. On the next screen you can set the time, subject line and sender address of the delivery. First, set the time of the delivery. Click in the first input box or on the calendar icon. Select the date from the date picker. Then select the hour and minute of the delivery from the boxes. Notice that the server time appears at the right side so, you can adjust time accordingly. If you select a time that has already been passed an alert message will appear. Then, define your subject line. 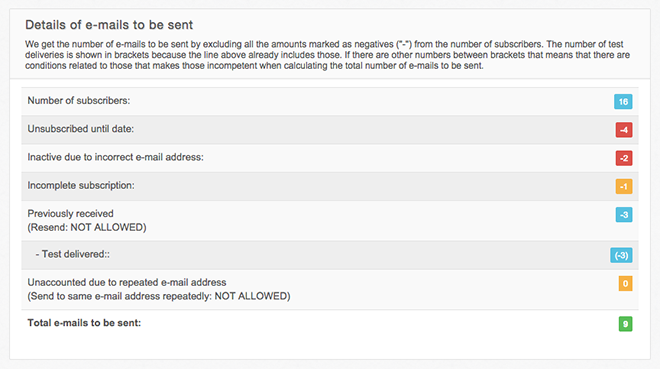 You can use merge tags to personalize the subject line, this helps to make it more relevant to the subscriber. To insert a merge tag click the [...] button, select a field from the list then click the "Insert" button. You can select the sender name and address from a list or you can type it directly. 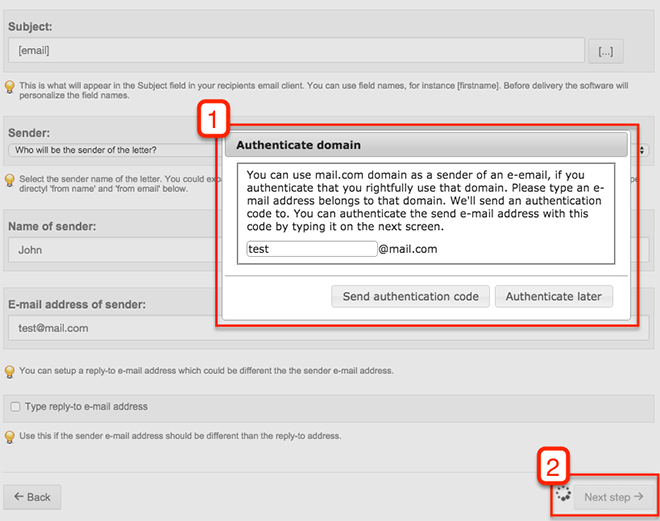 Important: you can only set an authenticated e-mail address as sender e-mail address. If the e-mail address you've typed is not authenticated after you click on the "Next" button a dialog will appear asking for the authentication of the e-mail address. Type an e-mail address that belongs to your domain. SalesAutopilot will send an authentication code to you; type this code on the next screen. If you want to use a different e-mail address as a reply-to address, click the "Type reply-to e-mail address" checkbox and type it. Click the "next step" button (if you haven't clicked it yet in the 2nd step of the wizard). On the next screen you can find some advanced settings. In most of the cases you won't need to change the default settings. Please do not modify them until you have fully understood their meanings. Allow periodic delivery? If periodic delivery is not allowed, the given letter will be delivered only once to a subscriber (even if more than one mailing would deliver the e-mail). Always set to 'No', except if you explicitly need to send the e-mail more than once to a subscriber. If you send the e-mail in March and then in May and the periodic delivery is not allowed the e-mail will be delivered only those subscribers who haven't received it yet. Send to same e-mail addresses? If an e-mail address is not unique in the list, you might want to deliver the e-mail to each identical e-mail address. If you select 'No', the e-mail will be delivered only to the first of the identical addresses. If you select 'yes', the e-mail will be delivered to each and every occurrence of the e-mail address. For example if you store orders in your list and at one point you want to deliver an e-mail about every order separately. Do you want to send to incomplete double opt-in subscribers only? If your subscribers could subscribe to your list with double opt-in method, it might occur that some of them accidentally didn't confirm it (for instance, they ignore the confirmation request letter). If you select the 'Yes' option, the letter will be delivered only those who subscribed with double opt-in method and haven't confirmed their subscription yet. Click the Next button. 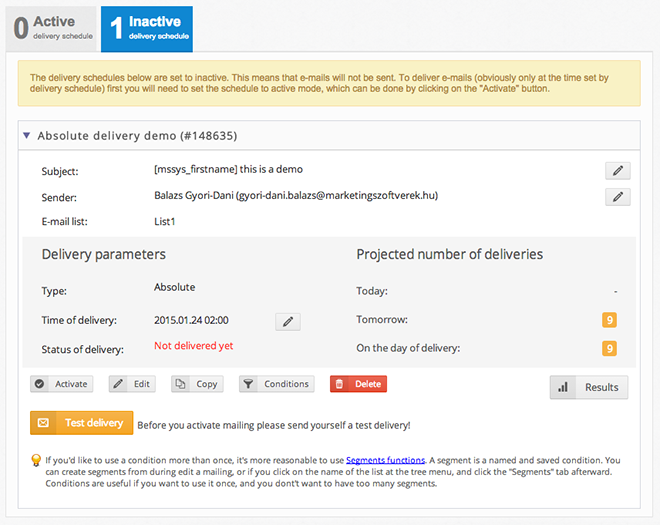 The e-mail review screen will appear with the details of the delivery schedule. There is a yellow warning message at the top of it that warns you that this delivery schedule is inactive. 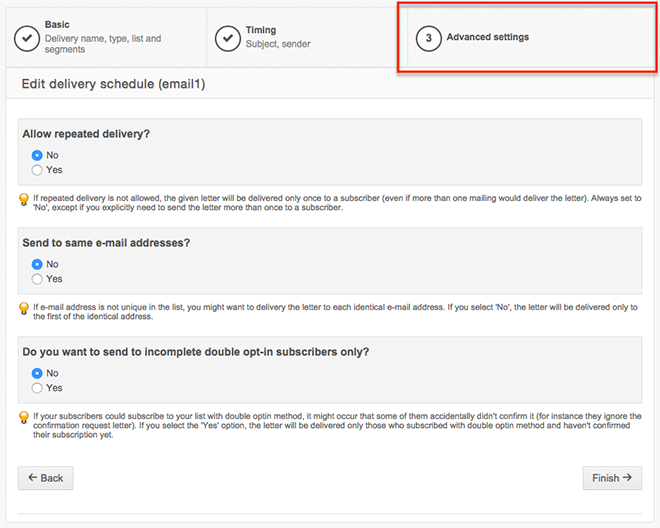 To deliver e-mails (obviously only at the time set by delivery schedule) first you will need to set the schedule to active mode, which can be done by clicking on the "Activate" button. There are several other buttons at the bottom of the delivery. 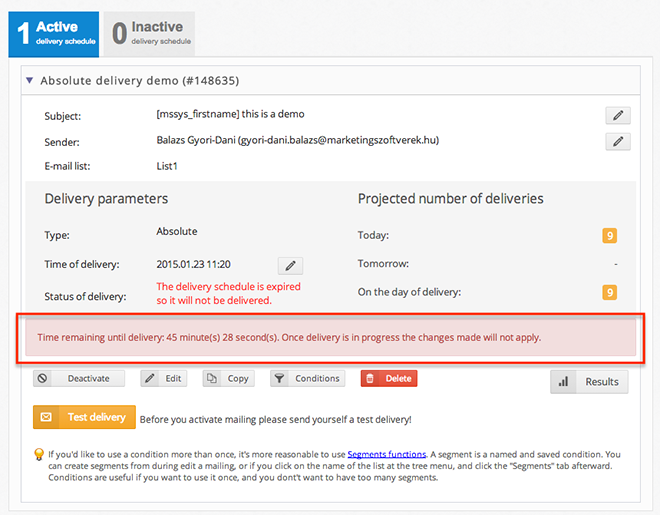 If you want to delete the delivery schedule click the "Delete" button. 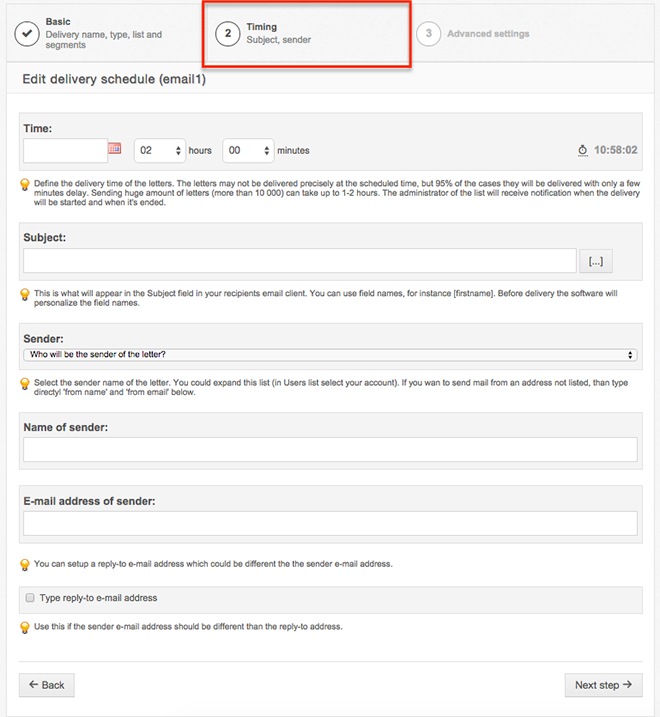 If you want to edit the delivery schedule click the "Edit" button. If the absolute delivery schedule has already been sent this button will change to "Details", because you can't modify it anymore. As you can see there is an icon next to the Subject and the Sender. Click on it and you can edit these in place. Click the "Copy" button if you want to create a copy of the delivery schedule. It is very important to test your e-mail before you send it to your list. 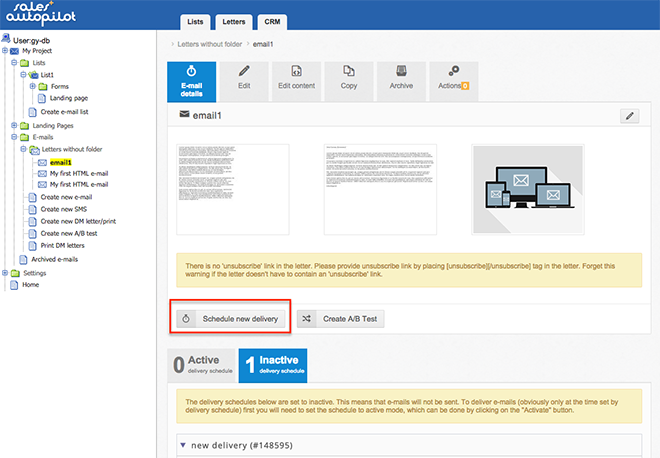 Click the "Test delivery" button and send test e-mails. The last button is "Results", if you click on it you can see the real-time statistics of the delivery. Clicking "Projected number of deliveries" displays how many subscribers will receive the e-mail. The numbers are between parentheses, because the delivery schedule is inactive. Click on the number and you can see the detailed explanation of the projection. On this screen you can click the numbers to list the subscribers. It's a very sophisticated method to analyze your delivery schedule. When you reviewed all the settings, sent test e-mails and you are sure to send the delivery schedule activate it by clicking the "Activate" button. If you change your mind and don't want to send the delivery schedule click the "Inactivate" button before the scheduled time. If there is less than 10 minutes before the delivery time a time counter shows you how much time you have before delivery. You'll receive a notification e-mail at the time SalesAutopilot starts to send the delivery and another one when the delivery is completed.